Alex Turner took inspiration from Leonard Cohen for the new Arctic Monkeys album. The British rockers' frontman changed his approach to songwriting when working on 'Tranquility Base Hotel & Casino' - the group's sixth studio album - after hearing the late, legendary singer/songwriter, who passed away in November 2016 aged 82, discussing how parts of his tunes don't necessarily make sense on their own. "But in the context of everything, I feel like you know exactly where he's coming from, especially with a writer like him - you're right there with him as you listen to a song of his in its entirety or a record. "Hearing him talk about that idea of pulling one thing out and it not making much sense is definitely something that spurred me on to approaching this record in that way and not be so concerned with making the thing be about whatever it's about." 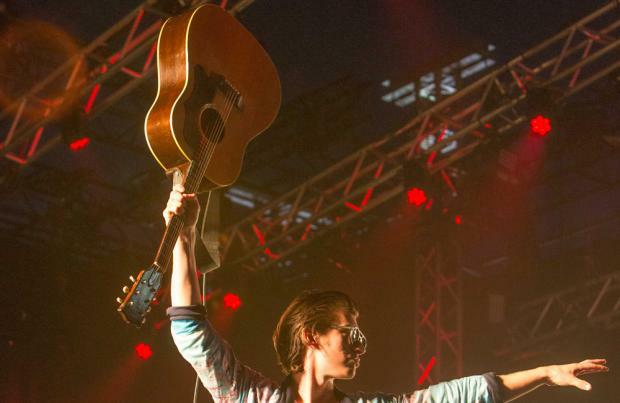 The 32-year-old singer became "less concerned" with writing tracks with their own individual ideas for the album, as he did with several tunes for the group's 2013 record 'AM', and The Last Shadow Puppets' 'Everything You've Come To Expect'. Speaking on BBC 6Music, he added: "I suppose on the last Monkeys record, and even the record I did just before this with Miles [Kane], there are songs that are about what they're about, you know? "Like 'Why'd You Only Call Me When You're High' or whatever, it starts and ends with here. "Maybe that thing spills onto some of the other tracks or the tone of that, but I think I became less concerned on this album [with] compartmentalising every idea to the point where each song became this episode that starts and ends in three minutes."